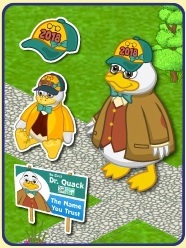 Dr. Quack is in the Kinzville Park until Wednesday, November 28th. His campaign promise is this: In the same way that we added Happiness, Hunger, Energy and Family Score boosts to all showers during my tenure as mayor, I believe we should do the same for saunas. We released one as a Deluxe Day prize this past year, but if I’m re-elected, I will make it my priority to make one that’s available to everyone, and to make all saunas provide care for your pets.